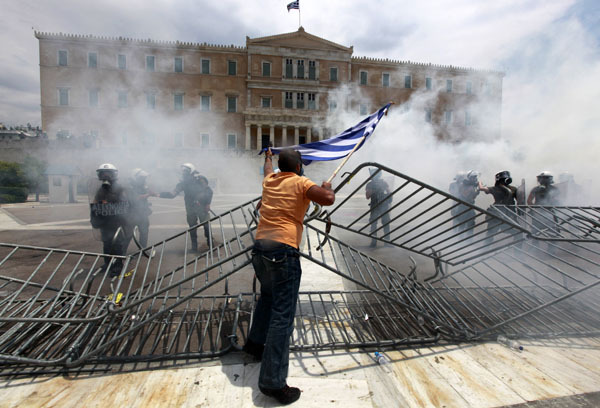 In Greece, radicalization leading to violent extremism and terrorism is mainly politically driven and connected with the outcome of two central traumatic events – the civil war of 1944-1949 and the military dictatorship of 1967-1974. 1st phase, post-dictatorship period, 1974-2007: the Greek junta leaders are put on trial and democracy is re-established. Far left extremism emerges and far left terrorist groups are formed, led by the November 17 group. In its first attack, November 17 kills the CIA station chief in Athens in 1975. It goes on to carry out many more attacks up to the early 2000s. 2nd phase, 2008 – 2010: the police killing of teenager Alexandros Grigoropoulos in December 2008 sparked massive and violent rioting in Athens and other cities across Greece. This period saw anarchist-nihilist terrorism and extremism on both the far left and the far right. 3rd phase, 2011 to the present: the ratification of austerity measures led to popular unrest while increased migration flows fueled polarization between natives and migrants. This period saw more anarcho-nihilist terrorism and extremism on the far left and far right. Unrest spiked in 2011 in mass protests and riots against migrants after the murder of Manolis Kantaris by three Afghans. More unrest followed in 2013 after the left-wing rapper Paul Fyssas (Kilah P) was murdered by George Roupakias, a member of the far-right Golden Dawn group. Although there are some enduring long-term ideological drivers behind politically inspired radicalization in Greece, we can observe that there are also important differences between the three phases. Starting from the left wing – anarchist side, there are clear claims concerning revenge and payback in each phase. During the first phase we have revenge for the junta and its backing by the USA and anger directed at the political system for perceived injustices. In the second phase, the anarchist and far left groups called for rebellion and even outright war against the state as a response to state violence. In the third phase, calls for revolution were driven by repression and austerity measures. In light of the analysis above, it is obvious that the main threat of radicalization leading to violent extremism and terrorism in Greece comes from the politically driven spectrum. At the moment, the main threat is from the far-left and anarchist terrorist organizations. Their ranks are numerous and they are successful in radicalization and recruitment. Among them, the most important is the terrorist organization “Conspiracy of Fire Cells”, which has sent parcel bombs to European politicians. Another important organization is the activist/ extremist group Rubicon (Ruviconas), which is responsible for a number of extremist actions in recent years. Far-right extremism is also in also in the ascent in Greece. In fact, from the turn of the decade onwards one can say there has been a big bang on this side of the spectrum. There have been a number of incidents, most notably attacks targeting immigrants, leftists and anarchists, and new groups have been formed. The far right has also escalated to bombing. Recently, the Greek police arrested a number of members of the “Combat 18 Hellas” group, which has been involved in arson attacks and explosions. Another important factor is links between organized crime and terrorists, which are sometimes formed in prisons by first and second phase prisoners. Anarchist terrorist organizations in particular seem to have close connections with criminals, at least for the supply of weaponry and explosives. Finally, Islamist radicalization is not the main local concern but it is one of the major issues southern Europe faces at the regional level. At present, there is no extensive mobilization of the Muslim population in Greece but there are a number of risks which the country should manage in order to avoid the escalation of Islamist radicalization.